When warmists don’t like data, they simply throw it out – or hide it best they can. 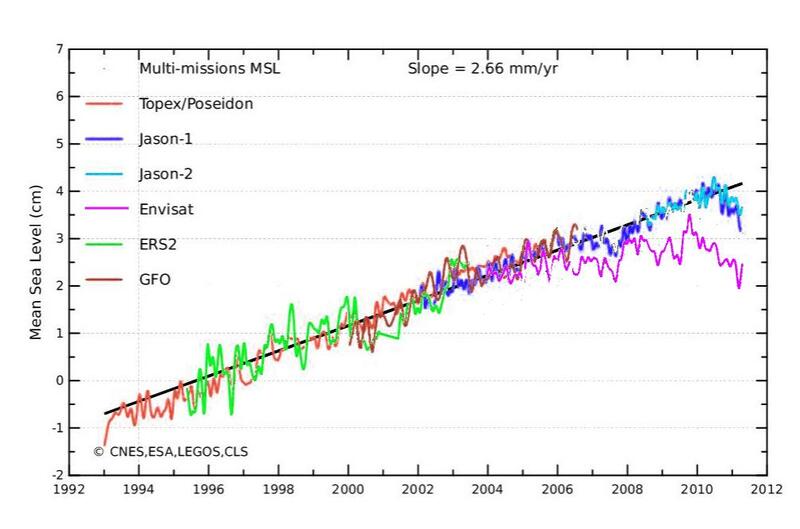 A great example is the Aviso “multi-mission” sea level graph, which purports to support the idea that sea level is rising almost 3 mm/year. But if you look closely at the graph, you can see that the most sophisticated satellite (Envisat) has been painted an almost invisible shade of light yellow. Below, I hue shifted the same graph, and it becomes clear why they did this trickery. There has been essentially no sea level rise for the last seven years. As Omnologos pointed out, there is a second ugly trick being done here. The Envisat data was plotted not normalised. The graph below normalises it – which makes it clear that they have a big problem. Envisat is suspiciously high at the start…wonder why? The absolute elevation of satellite readings isn’t a particularly meaningful number. What is important is the delta over time. I added a normalised graph to highlight the problem. No matter that sea level would have to rise over 6 ft to do that, and the NOAA lab would be under water…………. Big Pine is not sinking either…. That sounds more like a problem of groundwater extraction. It’s a common problem on small coral islands which have a very limited fresh water lens under them that is only recharged by rainfall. ( http://www.mdpi.com/2073-4441/2/1/1/ ) It is nothing to do with sea-level rise. I wonder where the NOAA lab get their water from? Satellite reading can only be related to satellite reading as long as the information was taken by the same satellite. His point though is that the drawing of the graph appears to be intentionally deceptive. Wow. What does normalisation mean here? I shifted the start point of Envisat (2004) to line up with the other satellites. A Warmist would say that the decline is masking the rise? Lying about sea level is a particularly dangerous venture, because people go to the beach every summer and can see for themselves. Plus people can step outside and feel the weather, this is why the CAGW scam is going to end in such a huge fiasco. I gotta ask, do they have a leg to stand on, is there any wiggle room that you can see? No trollbots have shown up yet here, so what do you anticipate will be their excuse? I’m just asking because it looks like you caught a big one here. Coupled with the fact that the Fox News website appears to be publicizing the .3mm added sea-level story, this one could easily sprout legs, or even wings. CU seems to completely ignore Envisat. The sea level scam appears to be one of the ugliest components of the AGW scam. Why did they do the yellow curve in yellow? Because it is almost invisible. I just want to make sure I am understanding the graphs correctly. Are they showing a change in actual sea level or a change in the rise of sea level? Hey Steve you should ask the old surfers who have been surfing for 50 plus years if they have noticed any difference in their local surf break. I haven’t and I have been surfing for 60 years. Went back to Sydney and my old surf breaks appear the same. And all those old beach houses and properties at North Narrabeen (famous surf beach mentioned in the Beach Boys “Surfin USA”) are still there. No apparent sea level rise on this part of the coast. There is a total disconnect from what the experts keep blathering to what is actually happening in the real world. Exactly. That is why people are starting to clue in. Sea level rise? Not a problem. Hurricanes? None have made landfall in the US for over 1000 days. Snowless winters? Yeah, right. One by one, the myths keep being exposed. Right on Andy but you forgot to mention that all of these so-called “experts” base their statements on once specific………..vested interests. However intelligent people see right through them. Very interesting! Can you elaborate a bit on why you think Envisat is the most sophisticated of these? I don’t doubt that it is, but I’m surprised there is so little agreement between Envisat and Jason-2 (which is the youngest of these sattelites) measurements. Launched in 2002, Envisat is the largest Earth Observation spacecraft ever built. It carries ten sophisticated optical and radar instruments to provide continuous observation and monitoring of the Earth’s land, atmosphere, oceans and ice caps. Envisat data collectively provide a wealth of information on the workings of the Earth system, including insights into factors contributing to climate change. 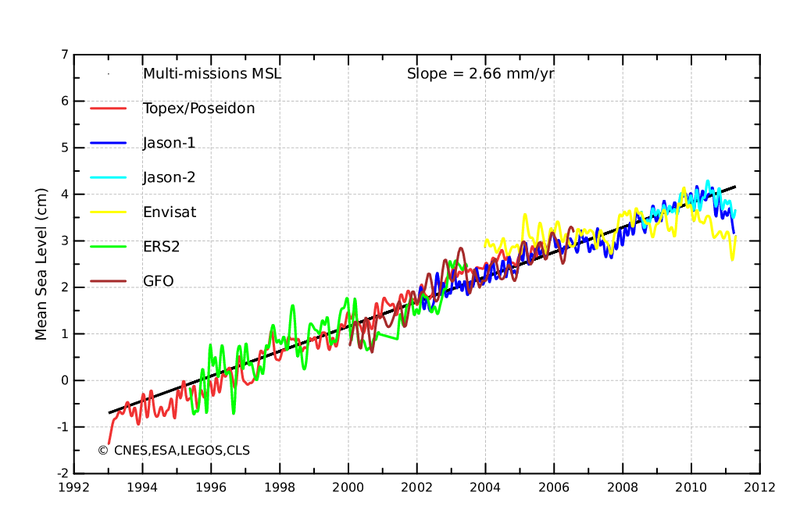 Funny, Mann is showing his new sealevelrise hockeystick right now. Real observational data did never stop him to rely on proxies to spread his scary climate doomscenario. These AGW-clowns have no dignity. wow the volcanoes and the sun are already affecting it, amazing how quick it can change! Kevin Trenberth says the missing global warming heat is sank into the oceans. Leaving aside that heat doesn’t sink, if it could the heat would make the ocean level rise because warming water expands. But that isn’t happening. So Kevin Trenberth is wrong. Another global warming scientist wrong. It is a common thing for global warming scientists to be wrong. There is no ‘missing heat’. The earth is cooling. It has been cooling since 1998. That’s why they cannot find global warming. Global warming is not happening. The earth has always warmed and cooled. It is nothing unusual for that to happening. The earth had warmed up until 1998. Now it is cooling. This cooling could continue for decades. Turbo, can you show me on a map exactly where the satellites are showing this sea level rise? Why not contact the scientists and get the answer directly from them? It’s generally more reliable than asking someone who you don’t know on a blog. According to Jason-1, almost all of the rise is in the Indo-Pacific Nope: your eye has been attracted to the red, but anything from the light green to the red is showing SLR >= 3mm/year. Note also that Jason doesn’t go higher than 70°, while IIUC Envisat covers nearly the whole of the globe. BTW talking of contacting the scientists: did anyone check the Envisat notes? Apparently they changed the orbit in Oct 2010, does that make any difference to the data product? Perhaps instead of just linking to images out of context you could be good enough to link to the place where they came from? Unless there is something that we shouldn’t see there? after cross‐calibration, see [Figure 1]). A little history about Roman Salt ports and where the sea level actually was 2000 years ago. Leaving aside that heat doesn’t sink,, Heat causes the surface water to evaporate, it becomes more dense due to the relative increase in salt concentration, so it will sink, taking the heat with it. Check out halothermal/thermohaline circulation. I notice that the plot’s address at AVISO contains the string “nogia_adjust”. Why did you choose this plot? The GIA adjustment is equivalent to -0.3mm/year, so you are understating sea level rise by showing this plot. Could you please give a link to where this plot appears at AVISO, so that it can be seen in context? The GIA adjust is nonsense. It is an political adjustment, not a scientific one. Humm, so a non specialist has decided that isostatic rebound is no longer applicable. Is the whole scientific community aware of this change to the laws of physics? BTW: you complain that the plot is shown in yellow. Is this a recent change? To be able to evaluate if it was intended to be misleading we have to know for how long they have shown it in a different colour and when they changed? The point at issue is simply that if we want to compare sea level changes now with earlier time periods, we must compare like with like. To introduce a new element that has not been factored in before and then say that the rate of sea level is increasing is not scientific and is also extremely dishonest. There are a lot more issues than that. The adjustment itself is dishonest. Nope: the isostaic rebound rate is, for all intents and purposes, constant over the time period involved. But the rate is different in different places, so if you want a global average you have to take it into account. That is like “when did you stop beating your wife?” That’s like admiting there has not been a colour change, so from the very beginning they knew in advance that there would be something to cover up. Isostatic rebound is irrelevant for measuring sea level from satellites. It is based on the idea that the bottom of the ocean is losing elevation, not that the top of the ocean is gaining elevation. The adjustment is complete, utter rubbish. Sea level is relative to the adjoining land surface just as land elevation is based relative to mean sea level in that region. Isostatic rebound is evident in many locations as is soil compaction in delta regions that are built up silt deposits. Regional sea level is a dynamic process and has never been static so a number for global sea level is meaningless. The Himalayas are growing at centimeters per year and the Appalachians are eroding at centimeters per year. The Pacific Ocean is shrinking and the Atlantic Ocean is growing. All the plates are moving both vertically and horizontally. Changes do NOT happen at a steady rate so applying a steady rate adjustment is like making up fairy tales which the Climatologists have proven to be good at. Why would the ocean floors be rebounding? They were not covered with ice, the continents were. This across the board fudge-factor adjustment really is total BS. As the continents gain elevation, the sea floor loses elevation to compensate. That doesn’t raise sea level. GG said:Changes do NOT happen at a steady rate so applying a steady rate adjustment is like making up fairy tales which the Climatologists have proven to be good at. Note that I said the isostaic rebound rate is, for all intents and purposes, constant over the time period involved. That’s the time period since 1992!!! If you have contrary data please show it. Rebound is an inaccurate term. It’s actually an adjustment. Without going in to great detail the ice sheets push down the underlying mantle . As this mantle spreads outwards away from the pressure this causes the areas that are not covered by the ice sheets to rise. When the ice sheets go away, the area covered by them rises as the mantle pushed away flows back. Consequently the area which was not covered by the ice sheet and, that is now supplying the mantle, sinks. That’s why the rate of sea level rise is adjusted with different values depending on position. All things being equal, the closer to the margins of the ice sheet, the greater the rate. That adjustment is unwanted and inappropriate. Lowering the sea floor does not cause the elevation of the sea to rise. It does not cause land to get inundated. A non-math specialist put it in. Paul H. and Steven are 100% correct. But then, we’ve seen this type of “thumb on the scale” before. we must compare like with like. Someone explain that standing wave in Indonesia. lol, that must be the anti-Isostatic rebound, I wonder if we should discount that by -0.3 mm? I was going to meet you at your hidey place, but it’s not there! lol, I didn’t go anywhere…….. Grumpy Grampy Mike found it. Or, you can just click on the link in my name……now. That’s what’s been happening, I clicked and kept getting the sign up page…. If you hurry…..lol you can be number 100!!! You seem to be saying that you accept all their data as gospel, and that sea level has actually risen for the last 20 years. And what happened to I don’t know, 30 gigatons of water? At least several cubic miles of water went somewhere….oh there were apocalyptic floods in China, Afghanistan, Sri Lanka, and quite a bit in the US. Wow, 30 gigatons, you say. Boy that sure does sound like a lot. I wonder how many meters that would raise the sea levels by? I can’t wait to see your math. These were floods that put thousands of square miles under deep water. Maybe that’s where the water went. We all seem to be arguing at cross purposes. In the past the only measurements we have had are tidal guages which record sea level and not the amount of water in the sea. Therefore the new measurements which attempt to measure the amount cannot be compared with any meaning to the old sea level readings. Envisat doesn’t show any sea level rise. Interesting to see that Envisat does not show any sea level rise. Also that Jason doesn’t go higher than 70°, while IIUC Envisat covers nearly the whole of the globe. Perhaps it is time to revisit this plot.